Wadsworth (Rodney McKinner) reveals the night's true intentions to the guests. Audiences are raving about the Poplar Pike Playhouse’s latest production Clue: On Stage. “Hilarious! It was very enjoyable and it kept you guessing the entire way,” said Amanda Killebrew. This version of Clue is a play based on the classic board game as well as the movie, both with the same name. “I remember the movie with Tim Curry and thought it had a phenomenal cast," claimed John Whitehead, a self-proclaimed Clue fanatic. The play begins on a dark and stormy night at a very unusual party. Each guest has a colorful alias, a variety of weapons, and the host is, well…dead. The question on everyone’s mind is ‘whodunnit’? Join the lively cast of characters known as Scarlet, Plum, White, Green, Peacock, and Mustard as they race to find the murderer in Boddy Manor before the body count increases. All of the Clue guests prepare to meet their host for the evening, Ms. Boddy. 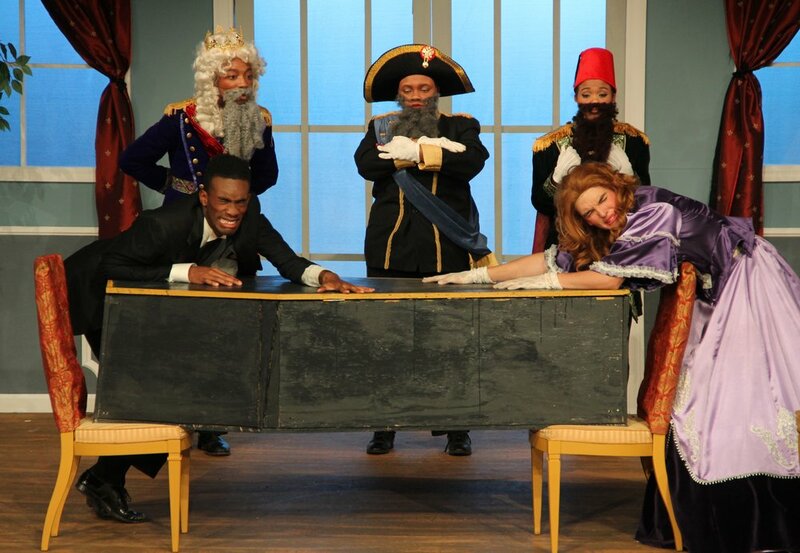 The students of Germantown High School work to bring Boddy Manor to life with it’s iconic characters: Miss Scarlet, Professor Plum, Mrs. White, Mr. Green, and Mrs. Peacock. “It was very playful and the costumes were fantastic,” said long time PPP patron Ann Argodale. Audiences are excited for opening weekend. “The production level is very high, as always, and the students are so talented,” said Whitehead. “I loved the timing and choreography of the game pieces. Does the group discover who murdered Ms. Boddy or will one of them (or more) fall victim in their attempt to play detective? Swing by the PPP to find out! Clue: On Stage runs through December 16. Tickets can be purchased at PPP.org or through the Poplar Pike Playhouse’s Box Office at (901) 755-7775. Tickets can be reserved two days in advance and receive a discount with the use of promo codes on the PPP’s daily updated social media pages (Facebook, Twitter and Instagram). The Poplar Pike Playhouse is located on the campus of Germantown High School. Diesel Care and Performance, Inc. is the corporate sponsor of Clue: On Stage. The characters spy on Wadsworth (Rodney McKinner) as he reads classified information that will determine the fate of the evening. The Poplar Pike Playhouse is excited to announce its upcoming fall production Clue: On Stage. Based on the classic board game and movie directed by Jonathan Lynn, everyone’s favorite ‘whodunnit’ comedy follows six “colorful” characters who are blackmailed for their scandalous deeds. Find out what happens when these individuals are invited to dinner by their mysterious blackmailer, Mr. Boddy. Led by Mr. Boddy’s butler, Wadsworth, an investigation into Mr. Boddy’s murder begins and as the night progresses so does the body count.Will these guests maintain their innocence? Will a murderer be revealed? Could it be Mr. Plum with the revolver in the library? “I am a big fan of the movie and I am so excited to bring it to the stage along with a little twist”, says director Jeff White. The iconic board game characters (CJ Jamerson, Andrew Heady, Hayden Belue, Mackenzie Kuykendoll, Rachel Christopherson, Kaitlyn Poindexter) of Clue come to life as they receive their infamous murder weapons for the first time. The cast of Clue: On Stage includes: Kimberly Baldwin, Hayden Belue, Jamaia Chase, Rachel Christopherson, Zoe Donndelinger, Andrew Heady, CJ Jamerson, Reyna Katko, Mackenzie Kuykendall, Landen Loschiavo, Rodney McKinner, Alexa Morris, Gilana Moody, Kaitlyn Poindexter, Rebecca Schranz, Jules Swenson, and Tye Washington. Make plans to be a part of the investigation when it hits the PPP stage December 6-15! Call for tickets when they go on sale starting October 22. For more information, call the Poplar Pike Playhouse Box Office at (901)755-7775 or visit PPP.org. To keep up with the latest news and get behind the scenes look, follow the Playhouse on Facebook, Instagram(@poplarpikeplayhouse), and Twitter (@ppptheatre). The Poplar Pike Playhouse is the theatre complex located on the campus of Germantown High School. Germantown Festival is Back and Better Than Ever! tEACHERS ASHLEIGH WILLIAMS, JEFF WHITE, AND CATIE WARD HELP CAPA STUDENTS SET UP TENTS FOR THE GERMANTOWN FESTIVAL. Get ready to shop ‘til you drop at the 47th Annual Germantown Festival! Offering delicious food, live entertainment, shopping, and more, the festival is definitely a family event that you do not want to miss out on this year. 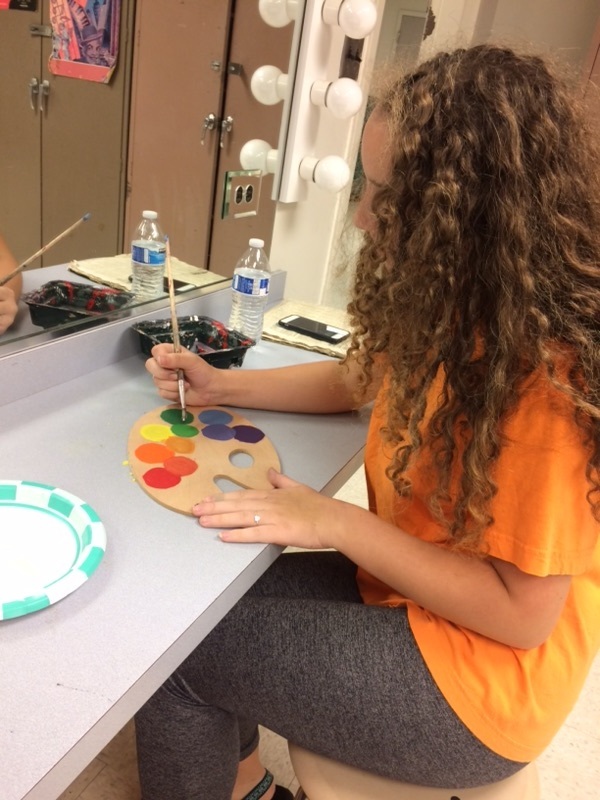 The Germantown High School Creative and Performing Arts department (CAPA) is also preparing for this year’s festival; offering game areas for kids and even a photo booth to make sure that you can remember those fun family memories forever. In addition, there will also be a three-hour live TV show to update you on all of the fun throughout the festival. GHS-TV’s Live Coverage of the Germantown Festival is produced, directed and hosted by students. “I’m really excited about producing the 2018 Germantown Festival. It’s something I’ve wanted to do & it’s an incredible opportunity to work with my classmates to make this show a success,” says overall producer Mackenzie Kuykendoll. This telecast will include interviews with community leaders, live performances on the GHS-TV performance stage, and student reporters, who will keep you updated on what is happening on the festival grounds. Along with GHS-TV, the GHS CAPA students will have their hands full as well. The students will be operating a variety of activities to add to the festival fun: including games, crafts, balloon animals, and face painting. Also, a concession station consisting of ice cold water, tea, and lemonade will be offered one block west of the festival grounds. “It takes a lot of work, but its rewarding to see everyone giving 100% to make sure we bring fun for children who attend the festival,” says Rachel Christopherson, GHS Chair of Festival Involvement. Baloon animals crew member, gilana moody, takes inventory for the baloon animals booth. Visitors not only can look for the Gameland area to support the CAPA program at GHS, but also another way to support the program is by buying a Best Book in Town coupon book membership which CAPA students will be selling all around the festival grounds.The new coupon book membership lets you connect to all of your coupons online. To top it all off, not only will buyers receive the membership that lasts through next year, but they will receive the coupon book for the remainder of this year as well.The coupons include a variety of savings at favorite restaurants, theatres, and other local attractions all around Memphis and it can all be yours for $25. The proceeds not only go to the programs within the fine arts department, but also to the Seth Matthew Rowan Memorial Fund which is used for scholarships and other opportunities for students. The 2018 Germantown Festival Overall Chairman is Rachel Christopherson. For GHS-TV, the Overall Live Coverage Producers are Mackenzie Kuykendoll and Kayla Frazier. Jamaia Chase and Chelbi Talley are the Guest Producers and Kendall Lesure and Kennedie Gillum are this year’s Talent Producers. Live Coverage of the 47th Annual Germantown Festival is Sunday, September 9th from 2-5 PM on ghstv.org and Channel 19 in Memphis. For further information, contact the Poplar Pike Playhouse Box Office at (901) 755-7775 or call GHS-TV at (901) 754-4788. The Poplar Pike Playhouse is ready to take kids on an “egg-cellent” adventure with the return of the Children’s Theatre. “Chicken Little’s Eggcellent Adventure” is a new take on the classic tale geared specifically towards children. It tells the story of Chicken Little who is trying to fulfill his dreams of being a popstar when an acorn suddenly hits him on the head. Fearing the sky is falling, Chicken Little rushes to gather his bird friends so they can warn the king. Along the way, they meet a new friend who offers the birds protection from the falling sky. However, Foxy Loxy is more sly than Chicken Little and the gang realize. The play is tailored to allow the audience to interact with the characters and help move the plot along. “Theatre is a really special art form because it is a communicative art,” says theatre teacher Jeff White. “There is constant communication between the actors and the audience. For kids to be part of the story, it’s a really invigorating experience for them that turns them on to theatre. “Chicken Little’s Eggcellent Adventure” will have a free public showing on Saturday, April 21st at 3:00pm. If you would like to have the cast of “Chicken Little’s Eggcellent Adventure” visit your elementary school for a private performance, email Jeff White at whiteja@scsk12.org. Bring your family to join Chicken Little and his crew on their great adventure! 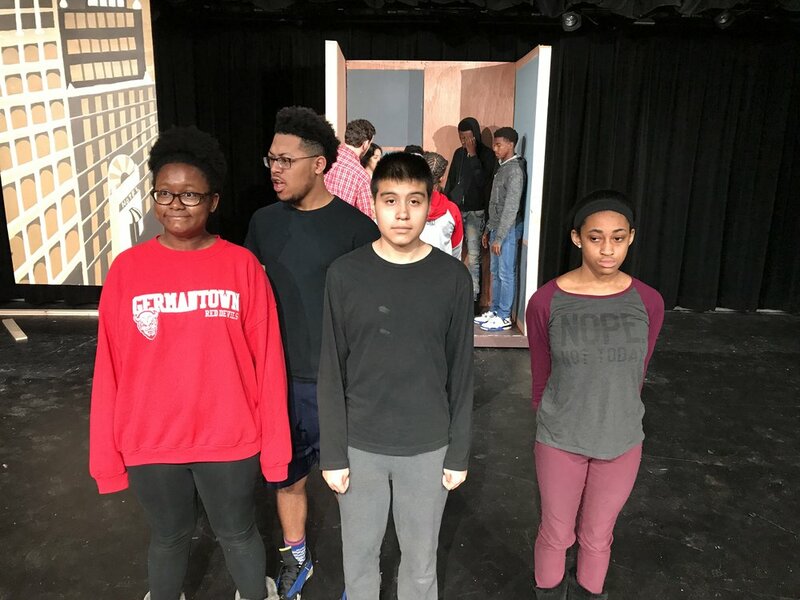 Theatre students at Germantown High School are ready to express their creativity and originality on the Poplar Pike Playhouse stage. 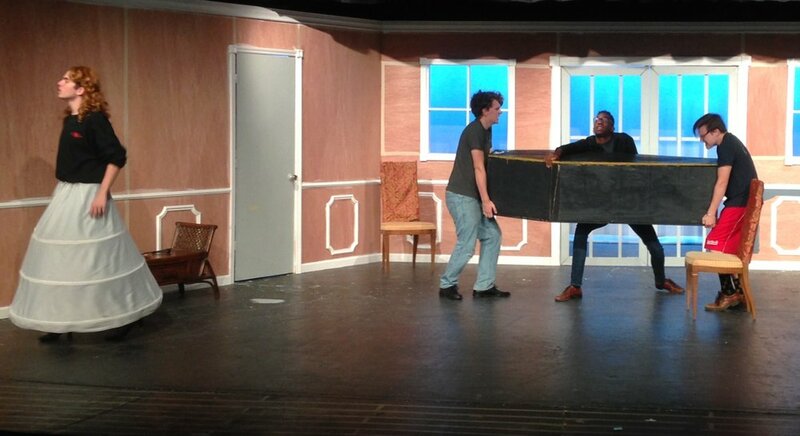 Students in the GHS Acting class are in the process of writing, directing, and performing their own 10-minute plays. 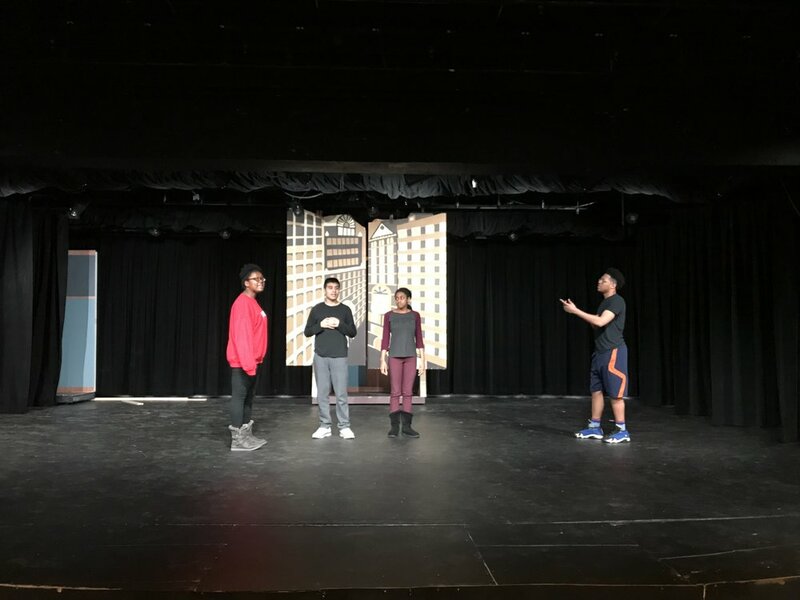 Acting teacher Jeff White has been assisting his students for the past few weeks on polishing and perfecting their work for the showcase. The preparations began in early February when students began the brainstorming process for their plays. The budding playwrights were given free range and free thought to write. Once the plays were chosen, directors and actors were assigned to bring these pieces to life. 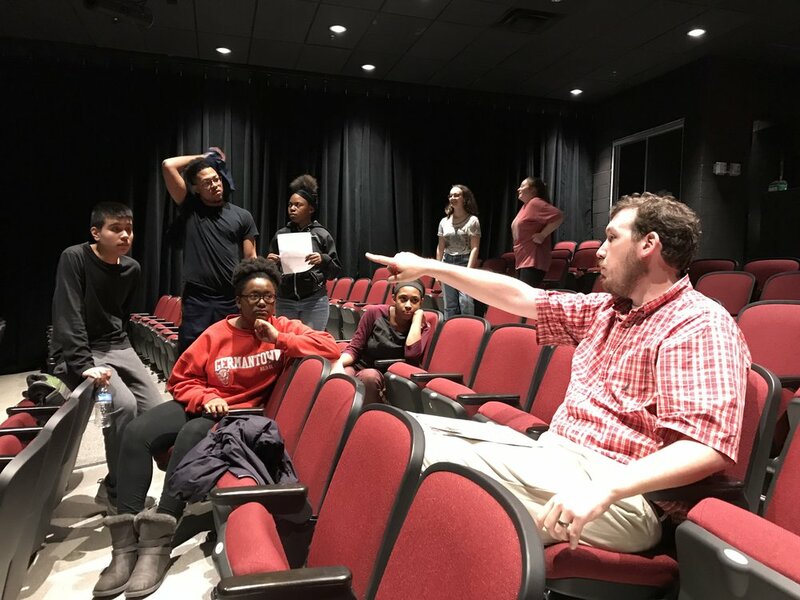 “The goal is to give my students the opportunity to build theatre from the ground up and take their own creation and put it on the stage,” says White. The 2018 10-Minute Play Festival is Friday, April 6th at the Poplar Pike Playhouse. The festival will begin promptly at 6:30pm. Admission is free, so anyone is able to come for a great night of acting. Call the PPP Box Office (901) 755-7775 for more information. Audiences are raving about Sweeney Todd: The Demon Barber of Fleet Street playing now at the Poplar Pike Playhouse . Opening night was full of excitement. Friends and family gathered to attend the tale of Sweeney Todd and their reviews lauded the Sondheim production. The world-renowned musical follows the story of Sweeney Todd, a barber who was banished from London by Judge Turpin so the judge could pursue Todd’s wife. When Todd returns, he finds Mrs. Lovett, an old acquaintance, and together they hatch a devious plan to get revenge on the judge. Sweeney Todd is a complex show to produce for both cast and crew. Each aspect of the musical requires immense dedication from everyone involved. Opening night was rewarding for all as audience members expressed their surprise and excitement with the show. There is still time to get your tickets to see Sweeney Todd: The Demon Barber of Fleet Street . The musical runs through March 10 at the Poplar Pike Playhouse on the campus of Germantown High School. Visit ppp.org, or call PPP Box Office at (901) 755-7775 for more information. Follow the PPP on Facebook (@poplarpikeplayhouse) or Twitter (@ppptheatre) for updates and special coupon codes. Rachel Christopherson (Johanna) and Kyle Bowers (Anthony Hope) embrace after they perform their love song "Kiss Me". The Poplar Pike Playhouse’s spring musical Sweeney Todd: The Demon Barber of Fleet Street is ready to open its doors for opening night. This ominous musical follows the path of a barber, Sweeney Todd, who was sent away to solitude by Judge Turpin for a crime that he did not commit. Todd returns to get his revenge and try to restore the family that was taken away from him. With his partner in crime, Mrs. Lovett, his revenge has no bounds. Audiences may be familiar with the works of famed composer Stephen Sondheim and his popular list of musicals which include Sweeney Todd. While each show is unique, Sweeney Todd is a production full of musical and technical complexities. The set design includes secret doors and compartments that literally set the stage for the sinister spin in Sweeney Todd’s life. “Figuring out the setting of this musical and the ways of Sweeney Todd allow me to attempt to live the life of a character who is the antithesis to who I am,” says Rodney McKinner, who plays Sweeney Todd. Mackenizie Kuykendoll (Mrs. Lovett) offers Andrew Heady (Tobias Ragg) some meat pies and gin from her pie shop. Due to the popularity of the musical, many student actors auditioned for a part in the show. This depth of talent presented the opportunity for a larger ensemble so audiences can expect to see some new faces alongside some familiar ones. “This will be my first time joining the many talented actors and actresses on the Poplar Pike Playhouse stage, and this is truly one of the greatest things I’ve ever experienced,” says Kimberly Baldwin. “Although I had a family in the orchestra pit for the past two years, becoming a cast member in Sweeney Todd has given me a new, incredible family that I’m honored to be a part of,” says Allison Lee. Sweeney Todd: The Demon Barber of Fleet Street opens February 22nd and runs through March 10th. Call the PPP Box Office at (901) 755-7775 or go to ppp.org to reserve your seats today! Follow the PPP on Facebook, Instagram (poplarpikeplayhouse), and Twitter (ppptheatre) for updates and special coupon codes for our shows. Anthony Hope (Kyle Bowers) sings a love song to Johanna (Rachel Christopherson). At first glance, Sweeney Todd appears to be a gruesome show. However, lying just below the surface is a world of forbidden romance, selfless sacrifice, and pure love. Ashleigh Williams, the director of the PPP’s upcoming spring musical Sweeney Todd: The Demon Barber of Fleet Street, says defending someone you love is the consistent theme throughout the show. As the show opens, the audience learns that Todd has just escaped from an Australian jail as a result of being wrongly imprisoned by Judge Turpin. The Judge fell in love with Sweeney’s wife, so he sent Todd away to pursue his spouse. If this wasn’t enough, the Judge also takes in Todd’s daughter, Johanna, as his ward and begins to lust after her. It is Todd’s love and longing for his wife and daughter that give him strength to find his way back to London and find the Judge. He seeks justice for his family and for his lost love. Todd’s murderous ambition is justified, and the townspeople eventually find themselves sympathizing with him. Todd, in an odd, offbeat way, is a very relatable character. “Pain and love can make people do crazy things and anyone can experience those emotions, whether the hero or the villain,” says the PPP’s own Sweeney Todd, Rodney McKinner. “This doesn’t make Sweeney the villain, it justs makes him human.” Though the musical is filled with Todd’s revenge, he may be the true victim. Tickets are on sale now for Sweeney Todd: The Demon Barber of Fleet Street. The musical runs February 22-March 10 at the Poplar Pike Playhouse on the campus of Germantown High School. Visit ppp.org, or call PPP Box Office at (901) 755-7775 for more information. Follow the PPP on Facebook (@poplarpikeplayhouse) or Twitter (@ppptheatre) for updates and special coupon codes. Music Director Matthew Hayner works with Scarlett Simpson (Beggar Woman) her operatic tone. Sweeney Todd started out as a character in a weekly Victorian literature series. It wasn’t until 1973 that it reached the stage. Stephen Sondheim saw the stage play by Christopher Bond and was inspired to turn it into a musical. He felt that the addition of music would greatly increase the size of the drama, transforming it into a different theatrical experience. Sondheim himself has described this show as a "black operetta", and indeed, only about 20% of the show is spoken. The other 80% is set to music, either sung or orchestrated underneath dialogue. The musical score is so complex, cast members began rehearsals in December. “Learning the music to this show is not only pivotal to the plot, but is what makes it dynamic.”, says Rachel Christopherson who plays Johanna. “This show is nothing without Sondheim’s one of a kind musical style, so nailing the music is a main priority for this cast.” 32 students make up the cast, and with a musical as big as Sweeney Todd, no voice is too small. “All of the transitions, narrations, and drama are told through the singers. Each cast member plays a vital role in telling this haunting story”, explains musical director, Matthew Hayner. Music Director Matthew Hayner works with the ensemble trio. Producing a music heavy show like Sweeney Todd requires a very unique relationship between the director, music director, conductor, and cast. “There is a strong amount of players working to make sure learning this music and putting on this show is accomplished to the best of its ability, and I am so fortunate to be doing it with my directing team, and the hard-working cast members I have,” says Hayner. Tickets for Sweeney Todd: The Demon Barber of Fleet Street are on sale now! For more information, call the Poplar Pike Playhouse Box Office at (901) 755-7775 or visit PPP.org. To keep up with the latest news, follow the Playhouse on Facebook, Instagram (@poplarpikeplayhouse), or Twitter (@ppptheatre). The Poplar Pike Playhouse is the theatre complex located on the campus of Germantown High School. Sweeney Todd: The Demon Barber of Fleet Street will make its debut on the Poplar Pike Playhouse stage in February. This musical won eight Tony Awards, including Best Musical, when it debuted on Broadway in 1979. For nearly 40 years, Sweeney Todd has been produced all around the world, has migrated through the world’s leading opera houses and has been adapted to a film directed by Tim Burton starring Johnny Depp. Written by Stephen Sondheim, a name synonymous with musical theatre success, Sweeney Todd makes a significant theatrical impact through its powerful music and larger-than-life characters. The musical theatre favorite follows the story of Benjamin Barker (also known as Sweeney Todd) who was imprisoned by lascivious Judge Turpin for a crime he did not commit. He returns fifteen years later for retribution and restoration. He befriends a hapless meat-pie baker, Mrs. Lovett, and together they work to exact his revenge and to make her rich. Rehearsals have already begun. Those who have seen Sweeney Todd before know that seeing and hearing this work with a full chorus and orchestra, and sung by great lyric voices, can be a truly unforgettable theatre experience. For those who have not seen the show, this is definitely one to make plans to see. The cast of Sweeney Todd includes: Amber Allen, Kimberly Baldwin, Hayden Belue, Kyle Bowers, Rachel Christopherson, Erica Crosby, Abigail Davis, Breuna Dickerson, Antonio Johnson-Farrar, Kaleb Frieson, Kadiatu Gassama, Cecilia Hartney, Andrew Heady, DanE Henderson, Tate Jakobi, C.J. Jamerson, Reyna Katko, Elanis Kelley, Jahvon Key, Mackenzie Kuykendoll, Alanna Lee, Allison Lee, Rodney McKinner, Avery Moore, Alexa Morris, Christian Powell, Lundell Simmons, Scarlett Simpson, CJ Thomas, Xavion Thomas, Alan Toney, and Sophie Willis. Sweeney Todd: The Demon Barber of Fleet Street will be directed by Ashleigh Williams. Associate director is Jeff White. Musical director is Matthew Hayner. Technical director is Catie Ward. John Hagan is the conductor. Sweeney Todd: The Demon Barber of Fleet Street opens at the Poplar Pike Playhouse on February 22 and will run through March 10. Call the PPP Box Office at (901) 755-7775 or go to ppp.org to get more information! Follow the PPP on Facebook, Instagram (poplarpikeplayhouse), and Twitter (ppptheatre) for updates and special coupon codes for our shows. The Poplar Pike Playhouse is the theatre complex located on the campus of Germantown High School. The corporate sponsor is Landmark Community Bank. Chicago (Alan Toney) and "Daisy" (Kyle Bowers) attempt to hide a major discovery. Last weekend, audiences burst into laughter during the Poplar Pike Playhouse’s slapstick comedy Is He Dead? The play, by Mark Twain and later adapted by David Ives, centers around a fictitious tale of the hapless French painter Jean-Francois Millet. Struggling to make ends meet in 19th century Paris, Millet discovers the key to his survival is ironically death. Millet’s inner circle urges him to fake his death and mask his identity in order for all of them to benefit from the “late” Millet’s fame, riches, and critical acclaim. On opening night, Playhouse patrons raved about the humor of the show. “The show was absolutely hilarious and thoroughly entertaining,” claimed friend of the Playhouse Stephanie Thomas. Does Millet ultimately find happiness in death through fortune and fame or is he happier living a life of debt? Swing by the PPP to find out! Is He Dead? runs through November 4. Tickets can be purchased at PPP.org or through the Poplar Pike Playhouse’s Box Office at (901) 755-7775. Tickets can be reserved two days in advance and receive a discount with the use of promo codes on the PPP’s daily updated social media pages (Facebook, Twitter, Instagram, and Snapchat). The Poplar Pike Playhouse is located on the campus of Germantown High School. Is He Dead? is Ready for Opening Night! The widow Tillou (Kyle Bowers) prepares for her brother's funeral with an assist from her brother's friends (L to R: Andrew Heady, Alan Toney, and Tate Jakobi). The curtain is ready to rise on Is He Dead? the Poplar Pike Playhouse’s fall play. The comedy, written by Mark Twain and adapted by David Ives, opens Thursday, October 26th. 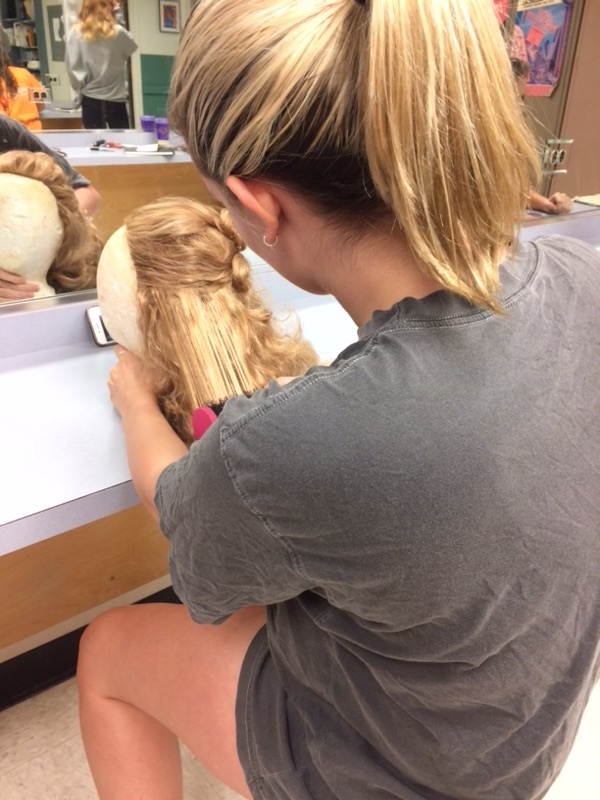 From backstage to onstage, the students are all been working diligently in anticipation of opening night. The play tells the fictional version of the real life painter, Jean-Francois Millet, who is in debt to an evil picture-dealer. With his friends’ help, he hatches a plan to fake his death to pay off his debt, believing painters find greater success selling their work posthumously. The plan could work, only if Millet can keep up his disguise as his twin sister, the Widow Tillou. The Poplar Pike Playhouse’s cast and crew can’t wait to open the curtains and share this hilarious play with the public. This comedy is definitely something that you will not want to miss. Is He Dead? runs from October 26th - November 4th. Call the PPP Box Office at (901) 755-7775 or go to ppp.org to reserve your seats today! Follow the PPP on Facebook, Instagram (poplarpikeplayhouse), and Twitter (ppptheatre) for updates and special coupon codes for our shows. The students of Poplar Pike Playhouse are hard at work preparing for this season’s fall play, Is He Dead? The satirical comedy, written by Mark Twain and adapted by David Ives, follows the fictional version of the great french painter Jean Francois Millet. Millet is strugglingto sell his paintings and pay back a cynical art dealer. Comedy ensues when he goes to great lengths for fame and fortune. While the cast rehearses each week, just as much preparation is happening off stage. 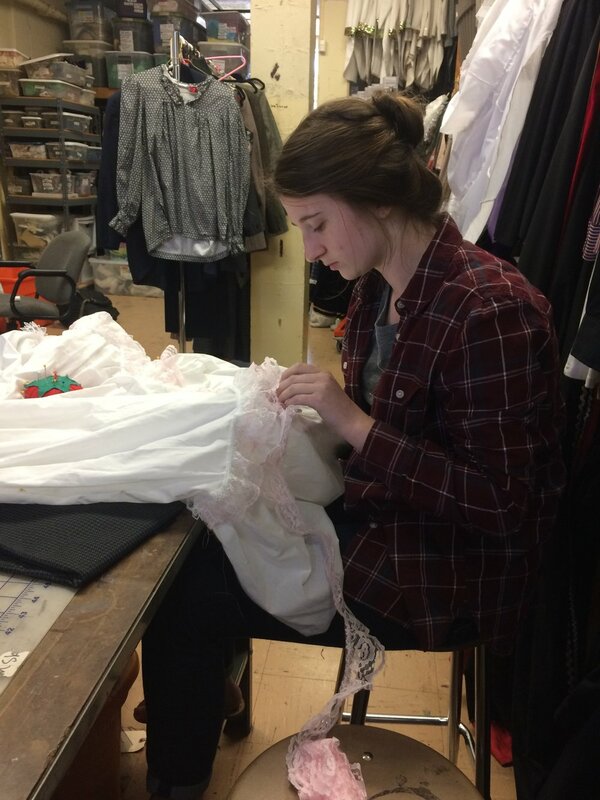 Technical crews are in full swing as costumes are sewn, sets are built, and so much more! 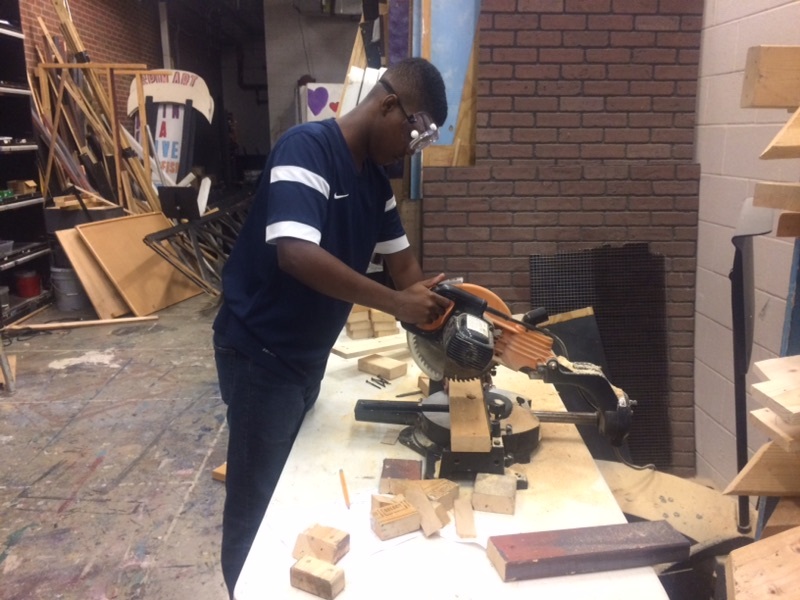 Master Carpenter Jason Harris cuts wood for the set of Is He Dead? While initially working separately, all the departments are starting to work together as tech week approaches. From the details on the poster to the color of a wig, ideas are coming to fruition. Slowly but surely, all of these moving parts are finding the way onto the newly renovated Poplar Pike Playhouse stage, and Is He Dead? is almost ready for an audience. Is He Dead? runs October 26 through November 4. Tickets are on sale now at the Poplar Pike Playhouse! Call the Box Office at (901) 755-7775 or visit PPP.org.. Adult tickets are $15.00 and student tickets are $12.00. To keep up with the latest news, follow the Playhouse on Facebook, Instagram (@poplarpikeplahouse), or Twitter (@ppptheatre). Is He Dead? is the latest production to hit the Poplar Pike Playhouse. The play, originally written by Mark Twain and adapted by David Ives, tackles the outrageously ridiculous yet satirical humor of the life of a painter. The play introduces us to Jean-Francois Millet, an actual French painter, who finds himself in situations full of hijinks and misunderstandings. “For part of the play, I am a woman. This is a lot harder than I initially thought,” says actor Kyle Bowers. “There are a lot of feminine mannerisms I wasn’t aware of and ladies shoes are not comfortable.” While this mistaken identity is comical, the additional cast of wacky characters, absurd situations, and jokes galore promises that audiences will certainly “die” laughing. The style of Is He Dead? pokes fun at the seriousness of melodramatic, classic theatre. While the show may not be well-known, the topic, main character, and type of humor are entertaining and widely appreciated. “I think that the characters in Is He Dead? lend themselves to the old vaudeville style of classic villain, damsel in distress, and of course the classic slapstick a la the Three Stooges,” says Jeff White, the play’s director. The over-dramatic personalities of old Vaudeville characters turn into comedic material on the PPP stage, with each of the show’s wild characters representing a certain stereotype. There are quite frequent direct references to the physicality of entertainers like Charlie Chaplain and Buster Keaton. Though this show has no music, the excessive physical comedy requires coordinated choreography to achieve the perfect timing. “Physical comedy is very unique,” says actor Andrew Heady. “It keeps me on my feet the entire time I’m on stage.” This tried and true style of comedy with a modern twist is sure to be a side-splitting hit as the PPP races toward opening night. Tickets for Is He Dead? are on sale now! The show runs October 26- November 4 at the Poplar Pike Playhouse. Visit ppp.org, or call PPP Box Office at (901) 755-7775 for more information. Follow the PPP on Facebook (@poplarpikeplayhouse) or Twitter (@ppptheatre) for updates and special coupon codes. Germantown High School’s Poplar Pike Playhouse presents the regional premiere of Big Fish. Based on Tim Burton’s 2003 motion picture, this musical adaptation is barely a year removed from the Broadway stage. Edward Bloom is a farmer’s son from Alabama who lived a life full of epic adventures, tall tales and imaginative friends. As Edward’s story draws to a close, his son begins a journey to discover his father’s true identity. Is Edward hiding behind his tales, or by understanding the stories will his son come to truly understand the man? Powerful storytelling, uplifting music and show-stopping numbers give this modern musical the feel of a big, Broadway classic. Be there when the Poplar Pike Playhouse becomes the first theatre in our region to bring Big Fish home to you February 26 through March 14. Visit ppp.org or call the PPP Box Office at (901) 755-7775 for more information. Follow the PPP on Facebook and Instagram (poplarpikeplayhouse) or Twitter (@ppptheatre) for updates and special coupon codes. The cast of Big Fish includes Maclean Mayers, Evan Hoover, Sydney Armstrong, Dailey Thompson, Raneem Imam, Hayley Bardos, Daniel Jaramillo, Elijah Bienz, Caleb Suggs, Ben Taylor, Brigitte Anderson, Alia Burrows, Arafat Quran, Chad Baker, Bryan Scott, Elana Leav, Jacob Kight, Sara Mayers, Jackie Kamin, Kaylynn Coulter, Amber Allen, Summer Eggert, Kennedy Harris, Kassie Kimble, Gabriel Portillo, India Scott, Lundell Simmons, Antonio Smith, Vontrell Thomas, Alan Toney, Alex Turner, Austin Carrico.